The Democrats, in an effort to defeat or at least delay the appointment of Brett Kavanaugh, have degraded politics to a new low by bringing unsubstantiated claims of sexual abuse in an eleventh-hour attempt to destroy his reputation and delay his confirmation. More and more Americans are seeing this for what it is—an embarrassing travesty. The Democrats are counting on this to lead to majorities in the mid-terms, but for more and more Americans the dirt is sticking on those throwing it. Responsible, fair Americans are enraged by this charade. Thankfully, even some long-term Democrats are embarrassed by this circus. Professor Ford is not the only person whose life has been upended by this troubling allegation. What of the distress of Justice Kavanaugh and his family who are watching his stellar reputation besmirched by multiple women with nothing but allegations. Such sexual abuse claims are impossible to defend without evidence to counter—it’s just he said, she said. In spite of having information for a month and a half that could have been investigated, Senator Feinstein did not bring it up at the public hearing or in private conversations with Judge Kavanaugh. More importantly, she did take advantage of a private confidential process to review the facts in such allegations. Yet Democrats want us to believe that such last-minute disclosures are not politically motivated. They want the FBI to investigate, but there is no place, no date, and no evidence to even look at! They are called on to do background checks not investigate sexual allegations with no corroborating evidence. These un substantiated claims that occurred 36 years ago in high school are impossible to investigate. Not even the New York Times could find any evidence to support the claims against Judge Kavanaugh. 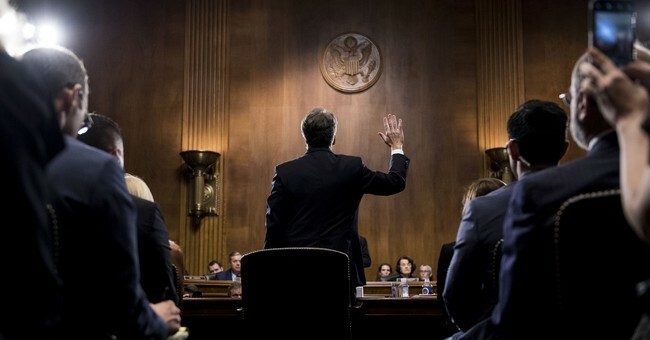 If you let these attack dogs take down this judge, who will want to be a judicial appointment when unsubstantiated allegations can destroy your reputation without proof. Of course, that’s what these extreme Democrats wanted. It’s time for Republican Senators to end this charade and approve this qualified judge to the Supreme Court. Many claim that Republicans have done the same thing. Show me the evidence. Challenge their record, yes. Attack them personally, no. Democrats successfully rejected Nixon’s appointments of Harrold Carswell and Clement Haynsworth Jr. President G. W. Bush appointed both Clarence Thomas and Robert Bork, but only Judge Thomas made it through the gauntlet of personal attacks. Yes, Merrick Garland was never given a hearing for consideration prior to the 2016 election, but his reputation was not attacked. In 2009, President Obama’s appointment ofJudge Sonia Sotomayor was approved 68–31, including nine GOP votes. His second pick in 2010, Elena Kagan was approved 63-37, with five GOP votes. Why did some Republicans vote to approve even justices they did not agree with? Because it’s a president’s prerogative to do so. Elections matter. It is time to hold the vote and confirm this judge. The left will scream and complain whether you hold the vote or not. The Democrat’s mission is clear—resist everything, delay whatever they can, and work to impeach Donald Trump as soon as they can. I challenge the GOP senators and fair Democrats to fulfill their obligation to approve a qualified judge that has been appropriately appointed by this president.